But Isn’t Red Wine Healthy? What About the Resveratrol? Alcohol is a Paleo gray area – some people feel just fine having a glass now and then, while other people feel much better if they give it up completely. It’s not like alcohol is a modern invention: humans have been fermenting things since we first figured out how to do it. But Paleo is not about what people did or didn’t eat in the Paleolithic; it’s about what is or isn’t healthy for humans in the 21st century. By that measure, it’s important to look at the actual evidence for and against specific foods, instead of arguing about whether or not cavemen would have had them. And when it comes to red wine, there’s certainly no lack of evidence! Every other week there’s a new study (a) supposedly confirming the evidence that red wine will make you immortal, or (b) supposedly debunking the myth that red wine has any health benefits at all. Most of the discussion tends to revolve around resveratrol, an antioxidant in red wine that’s either an anti-aging miracle or a total scam, depending on who you ask. But actually, resveratrol is just one of the many antioxidants in wine, and probably not even the most important. So here’s a look at resveratrol specifically and red wine in general: if you’re going to drink it’s one of the best choices around, and it does have some interesting health benefits, but there are also plenty of legitimate reasons for abstaining. You are not a mouse, and you are certainly not a glob of pancreatic cells in a petri dish. There’s not nearly as much evidence that resveratrol works the same way in humans. Drinking wine as a whole food is not the same thing as taking isolated resveratrol megadoses via supplements. Studies on supplements do not necessarily demonstrate any benefit from drinking wine, and studies on wine do not necessarily prove any benefit from supplements. In other words, the amount of resveratrol you’d get from a moderate consumption of red wine isn’t enough to actually achieve the results shown in the studies. And in fact, the form of resveratrol absorbed from actual foods is different from the form used in test-tube studies. Resveratrol supplements are another issue (although actually those have very mixed results and for every study showing benefit, there’s one that shows no effect), but if there are health benefits from wine, they aren’t from resveratrol, and studies on resveratrol supplements aren’t particularly useful in discovering what they are. But red wine is not just a resveratrol delivery mechanism; in fact, resveratrol is only a tiny fraction of the antioxidant content in the wine. There are all kinds of other bioactive compounds in there, and as usual, whole foods do not work the same way as isolated components! So what if you skip the resveratrol and look directly at studies that treat wine as a whole food? Resveratrol in isolation is disappointing, but there does seem to be a small health benefit from drinking a little bit of red wine regularly. If you’re going to drink alcohol anyway, it’s probably the best choice. But there are also completely legitimate reasons why you might choose not to drink it. Some studies have suggested that red wine may be beneficial for diabetes and blood sugar control (mostly thanks to antioxidants other than resveratrol). There’s also evidence that moderate red wine consumption is good for cardiovascular health. It might even be good for your gut flora, and what’s good for your gut flora is good for the rest of you. Binge drinking is obviously unhealthy; nobody’s advocating that. Alcoholism is dangerous. But there’s convincing evidence that a moderate (1-2 glasses per day) consumption of red wine in particular is harmless at worst and beneficial at best. 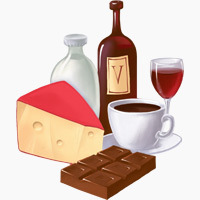 Red wine (like other fermented foods) is high in histamines, which some people are sensitive to. Red wine is also high in sulfites, which some people don’t have the enzymes to digest. If you’re one of those people, you might get headaches or other symptoms from drinking wine. There’s also the issue of contaminants in the wine, which can cause reactions in unpredictable ways. Then there’s the question of alcohol in general. Some people just don’t do well with it – it can be hard on your liver, and also act as a gut irritant in several different ways. Many of these only really show up in chronic alcoholism (not the same thing as regular, moderate drinking!) but they’re worth mentioning. In the end, it really comes down to what works for you. Alcohol is an ancient human tradition. 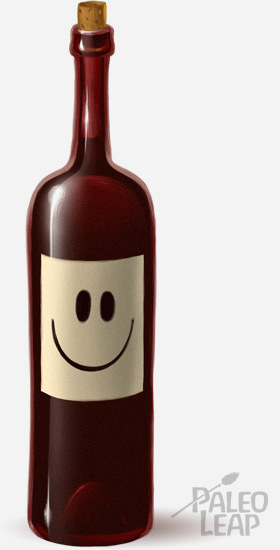 For most people, drinking antioxidant-rich wine in moderation is likely to be harmless or even beneficial. Other people just feel better when they avoid it completely: if a food makes you sick or leaves you waking up feeling like death warmed over the next morning, avoid it! Nobody needs to drink to be healthy. If wine doesn’t work for you, for whatever reason, don’t drink it! But on the other hand, moderate drinking can be a valuable part of a healthy social life and an important source of pleasure, and red wine in particular does appear to have some interesting health benefits. If you’re going to drink anyway, it’s certainly one of the better options. Most of those benefits probably aren’t about the resveratrol. Resveratrol is only one of many antioxidants in red wine, and it doesn’t even contribute a particularly large percentage of the total antioxidant capacity. But wine as a whole food is not the same thing as resveratrol in an isolated supplement, and it certainly can have a place in an overall healthy diet, if it works for you. What’s Wrong with Beans and Legumes?